NOVA 535 is hosting TWO Halloween events THIS weekend! Ok Tampa, if you are looking for What to Do this weekend for Halloween, NOVA 535 has the answer! Lisa here for an exciting update on Tampa Bay Events. Our partner (NOVA 535) is hosting a film screening celebration on Friday night, and their annual NOVAWEEN party Saturday night. So really if you wanted, you could make a whole weekend out of their events, and stay down in St. Petersburg near some of the best Tampa Bay Area Beaches. Now lets talk details for Friday night. The event Friday is the Immortal Island Film Screening Celebration. It starts at 6pm and lasts until 3am (Wow that&apos;s late!) Tickets are $5 in advance, $10 at the door, and $20 for VIP access (this includes the upstairs area and balcony). There is FREE valet ( I love that word! ), and full liquor available. The MC for the night is Ann P, and there will be hot dinner straight from the grill. 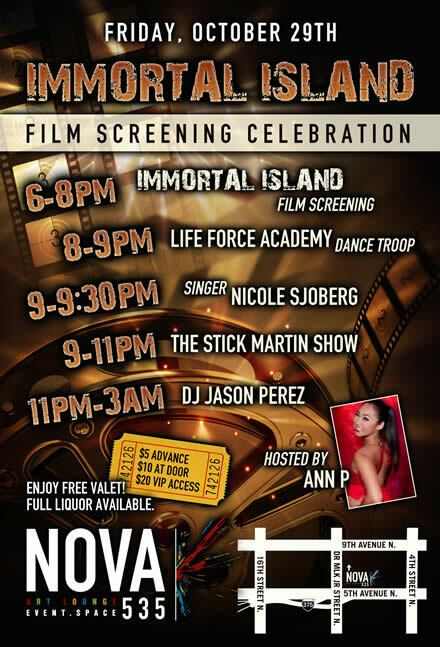 The Immortal island screening is at 7:15pm and the Life Force Academy Dance Troop will perform at 8pm. The rest of the night involves Nicole Sjoberg, The Stick Martin Show, and DJ Jasen Perez. Woah. That&apos;s a packed evening. And just when you thought you had recovered from the night before, NOVAWEEN IV is on Saturday night beginning at 8pm and lasting until 3am (This is why I suggested making a weekend out of it all!) It is only $5 to get in, and there will of course be a costume contest. Prizes will be awarded for the scariest, sexiest, and funniest costumes (so get those creative juices flowing, and show them what you&apos;ve got!) DJ Mega, Daniel "Motown Pride," and Ann Marie Cash will also be hanging out. Again, they are going to have a great dinner with burgers, wraps, fish sandwiches and a full liquor bar. That&apos;s a lot of fun packed into one weekend. But it all sounds amazing! That&apos;s all for now Tampa. But stay tuned for more Tampa Bay Film updates, and Tampa Florida News updates.